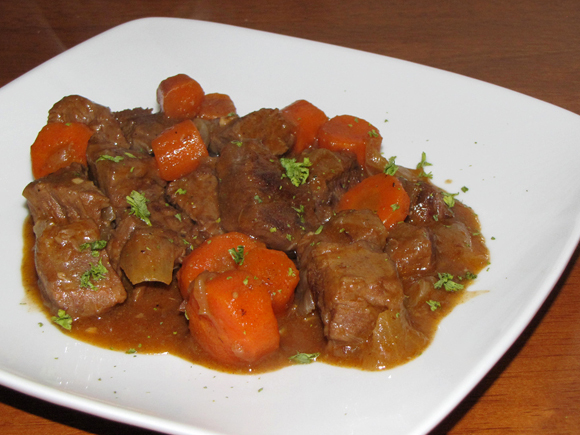 Braising beef is almost like making a stew, but the meat is cooked in less liquid. A stew is usually also cooked a bit longer to tenderize the meat more. Both cooking methods are great for less expensive cuts of meat because the tough tissues and fibers break down so much and all the added flavors come together to make that cheap meat taste like a million bucks. Okay, maybe not a million - but if it's done right, it's pretty darn close. Traditionally, braised meat is left whole while cooking, but I decided to cut mine into pieces. I know, I know...this makes you think I made a stew, right? Well, another wonderful feature of braising is searing the meat before adding the rest of the ingredients. This sort of locks in the flavor and helps to keep the juices from escaping the meat. Again, this can be done with whole meat or pieces. Feel free to keep your cut of meat in one piece if you'd prefer it that way. You might want to cook it for a little longer if you do, but the flavor will taste just as good! 1. Cut meat into 1" pieces. 2. In large pot, sear meat -in batches - in 1 TB oil over high heat until browned. 3. Reduce heat to medium and add carrots, onion and garlic to pot with meat. 4. Cook until vegetables are starting to soften. 5. Add flour and stir to coat everything. 6. Cook for two minutes then add broth and wine, stirring well. 7. Add tomato paste, vinegar, salt and pepper. 8. Bring to a boil then reduce heat to low. 9. Cover with a tight fitting lid and simmer for 1 1/2 to 2 hours or until meat is tender.